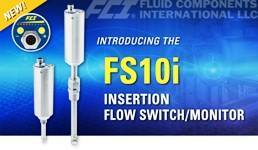 Designed for industrial processes, manufacturing operations, pumps, compressed air, gas compressors and HVAC systems requiring flow assurance and alarming, the compact SIL 2 compliant FS10i Flow Switch/Monitor from Fluid Components International (FCI) sets a new standard for superior performance and highly reliable operation. Wherever detection and user warning of a flow rate that is either too high, too low or a no-flow condition is required, the FS10i Flow Switch/Monitor is the solution. In air, gases, water or other liquids, its independently rated SIL 2 compliance ensures a highly reliable flow sensing instrument for repeatable and fast-responding flow trip point or alarm warning within seconds. The FS10i Flow Switch/Monitor features air/gas sensitivity and setpoint range from 0.076 to 122 MPS and for water or liquids from 0.003 to 0.15 MPS. It is suitable for use in fluid temperatures from –40° to 212°C and at pressures up to 138 bar. Unlike similar devices, the FS10i Flow/Switch Monitor comes standard with both a 1A relay output for alarm/trip point setting instead of an open collector, and a 4-20 mA analog output for trending and monitoring. Trip points can be set as high or low, and they can be adjusted with hysteresis and/or time delay settings and the 4-20mA output is rangeable by the user in the field installation. Applications for the FS10i Flow Switch/Monitor include cooling water and fluids, leak detection, lubricant flow assurance, ventilation verification, chemical injection assurance, nitrogen purge verifications and compressor leak detection.